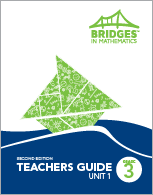 Developed with initial support from the National Science Foundation, Bridges in Mathematics provides the tools, guidance, and materials teachers need to implement the Common Core State Standards. The curriculum provides a unique blend of problem solving and skill building in a clearly articulated program that moves through each grade level with common models, teaching strategies, and objectives. Students at all grade levels are encouraged to explore, develop, test, discuss, justify, and apply mathematical ideas. Learn more about Bridges in Mathematics 2nd Edition. For more information about manipulatives and required items that are not included, download the Bridges Manipulatives List.